An hour with Failbetter’s follow-up to Sunless Sea. I’ve become the captain of my very own spacefaring locomotive. My ship chugs along, wheezing steam as I drift across a vast starscape. I press the F key and a bat flies off into the distance, returning with news of a nearby port. I follow the question mark that appears on my currently empty map and find myself in New Winchester, the bustling hub of The Reach—the only region available in this bare-bones Early Access build. “This is a small but functional piece of the entire game: a vertical slice,” says developer Failbetter on Steam. “We decided to launch with one region so we could give players a small taste of what the final game will be like, rather than a big taste of an emptier, less representational world.” Looking at my map I see that I’ll be able to visit places called Albion, The Blue Kingdom, and Eleutheria in the finished game. But for now I’ll dock in New Winchester and see what the city has to offer an adventurer. 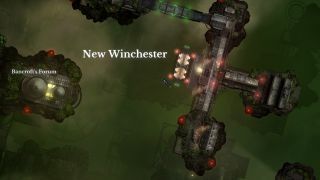 It seems New Winchester is the equivalent of Fallen London in Sunless Sea: a port I’ll be revisiting frequently to turn in reports, rest, resupply, and recruit crew members. Among the bustle and chaos of Wolvesey Station are a few opportunities, including some would-be pioneers seeking transport to a remote settlement called Port Avon. “My friend has been sending me postcards from there,” one of the settlers tells me. “I’ve never seen anywhere so quaint!” I agree and take them aboard, although I have no idea where Port Avon is. I figure I’m likely to run into it at some point on my travels, and if Sunless Sea is anything to go by, this may lead to an interesting encounter when I arrive. Other things I can do in New Winchester, but which are currently unavailable to me as a newbie captain, include purchasing a grand house. “The retreat of London’s forces has left many great houses empty,” the game says. “The Governor of New Winchester leases them out when the coffers are running low.” I can also retire, but that’s something I won’t be doing until much later in the game—if I survive. “You have lived enough,” the game says. “Now to enjoy the fruits of your labour. Perhaps you’ll have a library. Perhaps a carriage. Perhaps you’ll stop cutting your own hair.” Content with my visit to New Winchester, I decide to head back out into the stars. But not before spending some cash on fuel and supplies, the lifeblood of my voyage. Between ports and the stories they tell, Sunless Skies is about survival. Your fuel and food reserves are constantly dwindling, and if they get too low you’ll run into problems with your crew. At one point I run out of supplies and am forced to ration them, which almost triggers a mutiny. “The crew exchange sullen looks,” the game tells me. “When you finish addressing them, they do not disperse. Their grumbling deepens. You need to nip this in the bud before discontent becomes insurrection.” I can imprison the loudest mutineer, but lose a crew member in the process. I can impose strict punishments and increase the crew’s overall terror level. Or I can just leave them alone and the ship will slip into disrepair. Choices like these will dictate whether you make it back to New Winchester or die hopelessly lost among the uncaring stars. Just outside of New Winchester I see a strange, pink dolphin-like creature floating through a cloud of green gas. I open fire, even though the creature appears docile, and kill it. Apparently these creatures are called Cantankeri, and hearing their dying lament will grant me good luck. “Antenna wiggle resentfully in the wind,” the game tells me. “Eyes glower from the cavernous shell. The Cantankeri shudders in deep disappointment, before emitting a mournful “Muuuurrrrooohhh.” Then, silence.” I earn 50 experience points and feel strangely guilty about killing this thing, whatever it is. Hopefully this aggression won’t come back to haunt me later in the game. I don’t encounter any hostile creatures in my hour of play, and honestly, I can't say I'm disappointed: combat was by far my least favourite thing about Sunless Sea. I decide to head out into the depths of the heavens to see if I can find anything interesting. The map is terrifyingly blank at this point in Early Access, but I can send more bats out to find points of interest. Like Sunless Sea, there are many intriguing, beautifully written interactive stories out there waiting for you. But, alas, I don’t find any. I accidentally sail my ship into one of the regions in of the map that hasn’t been filled yet. I run out of fuel and supplies and it’s game over. But hey, that’s the Sunless series for you. Gruelling, unforgiving, but ultimately rewarding if you can make your way through this deadly void without dying horribly. As a brief taster this Early Access build has certainly whet my appetite, but I think I’ll wait on a more complete version of the game before I take to the skies again.